One of three suit containment rooms, where astronauts once got and will again get dressed for their visits to space. If all goes well, astronauts will soon launch from the U.S. for the first time in seven years — so NASA gave their departure lounge an upgrade. Wrapping up shortly, the renovations represent the first makeover of the facility, located at Kennedy Space Center in Florida, in more than two decades, according to a NASA statement. The facility houses a lounge where astronauts' families would wait for shuttle flights to land. Hence the renovation. "A lot of the astronauts have been amazed at how nice and clean and fresh everything looks," Lauren Lunde, who manages the quarters, said in the statement. NASA didn't specify how long the work has been under way or how much it cost. The entire crew quarters stretch across about 26,000 square feet (2,400 square meters) and include 23 bedrooms, a kitchen and dining room, and a gym. The facility also includes more-traditional offices and conference rooms, as well as the so-called suit room, where astronauts get dressed for their launches. The kitchen where astronauts' meals are prepared was renovated to feature new appliances. The renovations, the first major work on the crew quarters since 1994, included replacing carpet and ceiling tiles, repainting walls, and upgrading appliances. 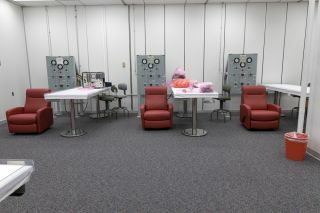 The former suit room was also modified to create three separate suit containment rooms for the three groups that will use the facility, NASA's Orion program, Boeing and SpaceX. Despite that trio of groups that will use the facility, NASA expects fewer people to stay there than at any time than during the shuttle era. Combined, the facility should see a maximum of only 16 to 18 guests at a time, NASA said, rather than having all 23 bedrooms filled. The crew dining room is located just off the kitchen and features lights that can be adjusted to simulate daylight or nighttime. The higher vacancy rates will be due to two new developments. The first is that all three new capsules will carry fewer people at a time than the shuttle did: from two to four crewmembers instead of from five to seven. And NASA has bulked up its quarantine guidelines, so it will have more staff members who support the crews staying nearby rather than staying in the building itself. The first wave of visitors to the upgraded facility should arrive soon, in time for the uncrewed SpaceX and Boeing test flights that are currently scheduled for August. Experts suspect, however, that these flights will be delayed by months. A hallway inside the astronaut quarters sports new carpeting and a fresh coat of paint. Those first visitors will likely include the astronauts selected to fly on the first crewed tests and full-fledged missions of the SpaceX and Boeing systems. These crews will be announced on Friday.